Buck Herzog was one of the most versatile infielders in the history of the major leagues; his 1,493 games were divided almost equally among second base, shortstop, and third base. His motto, "When you get 'em down, choke 'em," earned him the nickname "Choke 'Em Charley." 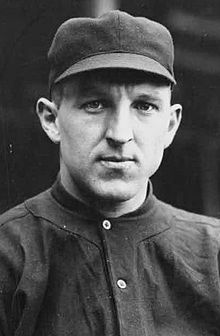 John McGraw signed Herzog for the New York Giants in 1908, beginning a baseball love-hate relationship exceeded perhaps only by George Steinbrenner and Billy Martin. No player better exemplified McGraw's ferocious fighting spirit than the 5'11", 160 lb. Herzog, yet the two generally couldn't stand each other. Over the course of a decade the Giants traded away the aggressive infielder three times and brought him back twice, both times experiencing immediate success when he re-entered the fold. "I hate his guts," McGraw once said about Herzog, "but I want him on my club." Charles Lincoln Herzog was born in Baltimore on July 9, 1885. When he was a child his family moved to a farm near Ridgley, Maryland, where Buck grew much-acclaimed cantaloupes during his playing career. After attending the University of Maryland, playing shortstop alongside future Hall of Famer Frank Baker, Herzog spent the 1907 season in the minors and signed with the Giants the following year. His ancestry was German Presbyterian, but his hooked nose and ambiguous surname caused many New Yorkers--including the Yiddish newspapers--to assume he was Jewish. As a rookie Herzog hit .300 in 64 games. He slumped in 1909, however, batting a mere .185. Stuck on the bench, he antagonized McGraw and earned himself an exile to the last-place Boston Doves. In Boston Herzog played third base in 1910 and shortstop the following year, developing managerial aspirations along the way. In 1911 he was leading the team with a .310 average when he ran afoul of manager Fred Tenney, who accused him and outfielder Doc Miller of "laying down" and fined them both. Herzog responded by going on strike, forcing a mid-July trade back to the Giants. McGraw's offense had faltered, but when he put Herzog at third base and young Art Fletcher at shortstop, the lineup jelled and marched to the pennant. Buck hit .290 for the season with career highs of 157 hits, 90 runs, 48 stolen bases, and 67 runs batted in. Herzog was a mainstay of McGraw's pennant-winning teams of 1911-13. His twelve hits in the 1912 World's Series set a record that stood for more than a half-century. For the Series Buck hit .400, stole two bases, scored six runs and drove in five. Ring Lardner wrote that Herzog "was more peppery than Captain Doyle himself and looked like an electric battery compared with Fletcher and Merkle. He played rings around any other man on the rival infields. He is a human illustration of the value of energy and application." But an injury early in 1913 caused Herzog to lose his regular third-base job; he wound up platooning with Tillie Shafer and suffering through a 1-for-19 nightmare in the 1913 World's Series as the Giants lost their third consecutive fall classic. That winter, while McGraw was on a world tour, Giants owner Harry Hempstead traded Herzog to Cincinnati for former stolen-base champion Bob Bescher. Hempstead knew that McGraw craved speed, but the temperamental manager was livid when he learned of the deal. In Cincinnati Herzog was named manager and played shortstop; his Reds finished last, but the Giants suffered without him. In 1915 Buck brought his team in seventh, ahead of only McGraw's. Herzog's tenure as Cincinnati manager was rocky. He battled with the front office, followed the McGraw tradition of terrorizing umpires and earning suspensions, and became frustrated by the failure of his players to match his overachieving style. Midway through 1916, a desperate McGraw sought to revive his floundering team by bringing back the dynamic Herzog. This time he traded three future Hall of Famers (albeit none at his peak)--Christy Mathewson, Bill McKechnie, and Edd Roush--plus $40,000 for Herzog and Red Killefer. Once again the move worked. McGraw played Herzog at in the infield, named him captain, and the Giants won a record 26 games in a row to climb to a fourth-place finish. At spring training in 1917 Herzog engaged in what writer Joe Williams dubbed "the Louis-Schmeling fight of baseball." When a golf outing caused Ty Cobb to arrive late for an exhibition game, the Giants razzed him so viciously that he threatened to "undress" them during the game. On a steal attempt, Cobb slid so high that he spiked Herzog above the knee. In the ensuing brawl, Cobb was grinding Herzog's face in the dirt when Jim Thorpe and others pulled them apart. After the game, Herzog challenged Cobb to a fight. They met in Cobb' s hotel room, with the furniture stacked up and only Eddie Ainsmith present as the third man. After a half-hour of mayhem, a bloody Herzog emerged, eyes nearly closed, and told teammates, "I got hell kicked out of me, but I knocked the bum down, and you know that swell head, he'll never get over the fact that a little guy like me had him on the floor." Playing second base, Herzog had a statistically subpar 1917 but led the Giants to another pennant (worst to first in two seasons). He hit .250 in the World's Series but made a key error in the pivotal Game 5, allowing the White Sox to tie the game. The Giants lost the Series, and McGraw quickly jettisoned the once-again-hated Herzog to Boston in a deal that returned former captain Larry Doyle to New York. In 1919 Herzog moved to Chicago, where he finished his career in 1920 amidst controversy. He was one of several Cubs suspected of throwing an August game to the Phillies, and though no solid evidence implicated Herzog, he was released along with the others. Later Rube Benton accused him of an attempted bribe, another charge that didn't stand up to scrutiny. Once waived out of majors, however, Herzog never returned. Known as a shrewd businessman who always negotiated more lucrative contracts than other players with similar talents, Herzog signed a record $12,000 minor-league contract. He split 1921 between Columbus and Louisville but quit playing when the contract was not renewed. In 1924 Herzog managed briefly at Newark in the International League, and he managed Easton in 1925 and 1926. He then signed on as baseball coach at the US Naval Academy, and when that post dried up he worked many years for the B&O Railroad. Later Herzog worked at a Maryland racetrack. Ironically, this man who had prided himself on his negotiating acumen and enjoyed the trappings of wealth during his playing career wound up destitute at the end of his life. In the winter of 1953 he was found penniless on the streets of Baltimore, ravaged by tuberculosis. Old baseball friends helped him out but he died on September 4, 1953, at the age of 67. Something Herzog once said about McGraw could serve as his own epitaph: "The old man and I had our arguments, I guess because we both liked to win so well. But, when he got into a pinch and needed someone to put fire into his team, I am glad to remember he always was calling back Buck Herzog."